This week, we asked our writers to cast their vote for who they believe should win each of the major post-season awards. The results of those votes are below. We did not cast full ballots and use a points system as the BBWAA will – we just asked everyone to select the player they would cast a first place vote for. As you’ll see, a few of the awards had general consensus, but there was also quite a spread of opinions at some of the more open races. I was actually surprised that these two were the only ones who got votes. The staff apparently isn’t buying into the Justin Verlander narrative, and no one decided that Curtis Granderson was having a better year than Ellsbury. Still, I think you could make a decent case for either of those guys, and I would have expected them to each get a couple of votes. Far less agreement, as Kemp just edges out Ryan Bruan in the voting. The two outfielders are both having great years, and there’s nothing wrong with either as a selection. Halladay also got less support than I would have expected, but he probably did better here than he will on the actual ballot. Not surprisingly, Verlander wins in a landslide. You can make a case for it being close and either one being a deserving winner, but you can make a stronger case that Verlander has just been better. Also a landslide over in the National League, but a more surprising one than in the AL. The staff clearly prefers Halladay’s method of getting outs to Kershaw’s. I think Kershaw will probably win the actual award, but the Phillies ace will be able to console himself with his eventual plaque in Cooperstown, I’m sure. No one gets the majority of the votes, but Pineda beats the field in a race with a lot of viable candidates. Toss in Eric Hosmer, Dustin Ackley, Jordan Walden, and Ivan Nova, and I have a feeling we might see an even more diverse ballot when the BBWAA votes. There are no shortage of guys who had decent-but-not-amazing rookie seasons in the AL this year. Braves pitchers run away with the voting here, with the staff shunning the Nationals pair of rookie position players. I would have thought Espinosa and Ramos would have each gotten a vote or two, but it’s hard to argue with Kimbrel’s dominance this season. The complete list of votes is below. A few writers abstained from voting for a few of the awards, and Klaassen’s vote of Bruce Chen for AL Cy Young was rejected. He’s currently being flogged at FanGraphs headquarters as we speak. We hoped you liked reading FanGraphs Staff Awards by Dave Cameron! Could a Pitcher Win the NL MVP? Very interesting. 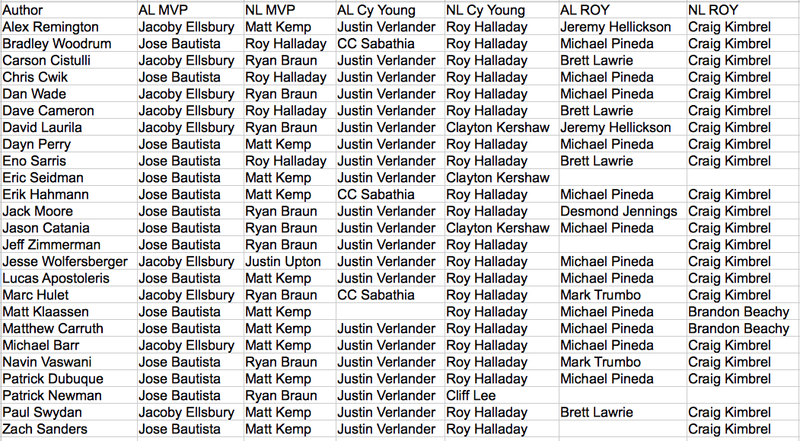 Fangraphs staff gave the awards to exactly who I would have.